Polaris Automatic Pool Cleaners have several new features. The Polaris 9300 is a water propelled robot similar to the Aquabot Turbo T. The similarities stop right there. I had the opportunity to see and inspect the 9300 Sport at an authorized repair shop and retailer of Polaris Pool Cleaner parts Aquaquality Pools and Spa, Inc. The Polaris 9300 Sport has a cartridge filter that is easily and conveniently accessed by opening the top of the robot with a quick release and pulling out the filter by it's handle. The only drawback to a cartridge is not being able to use disposable bags. The filter media of the cartridge looked to be about 100 to 50 microns efficient. I could not locate the exact filtering efficiency. There is a handle on the cartridge and this is the best part of the robot. You will keep the gunk hands to a minimum with this machine. The filter intake was the largest I have EVER seen anywhere. Leaves, acorns and small twigs should be an easy clean-up until the modestly sized cartridge is full. Be certain to check for small toys! This machine comes with a large pump, 4800 gallons per minute. A 60 foot cord and caddy for it's lean 16 pounds. It has a front brush and looks like a racecar. I normally associate Polaris automatic pool cleaners with pressure types that must be attached to the pool's filer system. NOT the 9300. This machine is a self contained robot that will climb the walls and the stairs. Be aware that the ability to climb is directly influenced by the amount of debris in the cartridge. 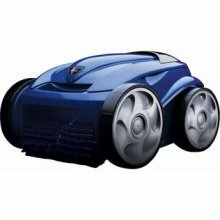 This robots main competition would be the Aquabot Turbo T and Smartpool cleaners.